In previous parts of this tutorial I’ve written about the basics of Othello’s strategy, quiet and loud moves and about starting the game. If you already know all this and you’ve played a dozen or tens games, you might have noticed one thing. The moves made at the edge of the board have a huge impact on victory or defeat. In the next lesson we will discuss the edge play. Let’s start with explaining a concept of an edge. In this post I use the word “edge” to describe not only a squares near the edge, but also disks placed on these squares. Why edges are so important? Othello board has 64 squares. At the beginning of the game 4 fields are occupied and players fight on the remaining 60 squares. 28 squares of these 60 are located near the edges of the board so almost half of the moves are made on the edges! The four edge fields are corners and you already know they are especially valuable – they allow you to build stable disks. The remaining 24 edge squares are also of great importance because disks placed on these squares can be captured only vertically or horizontally (not in both directions at once). And since the ability to attack these disks is limited, it means that wining the edge can strengthen your position or negatively impact the mobility of the opponent. And that’s what you want. Edge play involves few new strategic concepts you should learn: balanced edges, unbalanced edges, wings, pairs, wedges and anchors. You also need to understand a concept of tempo, important not only when playing near the edge. Before we explain all this, let’s see what happens when game comes to an edge. Image below shows first example of game that has reached the edge. Black played A5 and took the first square on the left edge. White is next to move. Don’t look for the best possible move for White, but let’s just focus on what White can do if he would like to takeover the edge? White can “attack the edge” by playing A4, just near the black disk at A5. It would make a position shown below. Of course, Black can regain control over the edge by playing A3 immediately (square marked with a star). So… every time you play next to opponent’s disk on the edge, the opponent can easily strengthen his position on the edge by taking your disk. In the position shown above, after playing in A3, Black will have three disks on the edge. In practice it often happens that one player “creeps” slowly along the edge and such creeping may be a good way to win a corner. Can White do something to play on the edge without allowing Black to creep? Yes. Let’s say he would play A3 instead of A4, leaving a 1-square gap between two disks. On the image below the gap is marked with a white star. Now White has to wait. If during the game Black will be forced to play A4, White can immediately respond with A6 to win the edge. Is control over the edge always paying off? Well… its not always most important. But remember to pay special attention to all opponent’s moves near your edge disks. If opponent plays there, you must be ready to respond if you want to retain the edge. Examples of balanced edges are shown on the image below. Edge is unbalanced when a player occupies several fields on the edge and his disks are not “centered”. Unbalanced edge can consist of 2, 3, 4 or 5 discs. The examples are shown on the image below. Usually balanced edge is better than unbalanced edge. Balanced edges are less vulnerable to attack and balanced edges made of 6 disks are especially strong. Just like the bottom edge on the image below. Usually it pays off to balance your edges or force opponent to build an unbalanced edge. Usually unbalanced edges are more susceptible to takeovers or wedges (we will discuss wedges soon). Unbalanced edge composed of five disks is called a wing. Such edge always adhere to one corner. On the diagram below we see the wing on the top edge (built of black discs from C1 to G1). At first glance wing seems to be a strong construction. After all, it’s hard to take it over without losing a corner (if white plays B1, he loses corner at A1). The problem is… White can sacrifice the corner to get something better! Remember – strategy rules are not sacred and sometimes you have to break them. You should try to win corners, but sometimes it’s good to sacrifice them. In the situation shown above (example 5) White can play A3. Below you can see what he gets. Of course Black will play A1 and will take the corner. It’s obvious, but let’s wait! Square B1 remains empty and White can play B1 in the next move. And then he gets this (see image below). It’s clear that, regardless of next Black’s move, White will play H1 and take the whole edge from H1 to B1. Let’s assume that Black played in B2 and White answered with H1. Each player lost one corner, but White is the one who won the top edge. Disks from H1 to B2 are stable (they attach to a corner). Of course this is not the end of the game and many things may happen, but White has won the fight for the top edge. Remember that attacks on wings can be very strong even if they are made by sacrificing a corner. Sometimes you just can’t avoid having a wing. What to do then? You should not take the corner immediately. Sometimes it’s better to wait. Each next move may open new possibilities. The situation described above is an example of the wedge – a group of your disks placed on the edge, next to a corner taken by opponent in such a way, that opponent can’t do anything with them. In the example above White has created a wedge that reaches his corner, but it’s also possible to put a wedge between two corners taken by the opponent. Below you can see a beautiful example of a wedge on the left edge. White put five disks between two corners won by Black. It is worth knowing that making a wedge is easier in some specific situations . Picture below (Example 7) shows one such situation. Example 7 – wedge is coming! 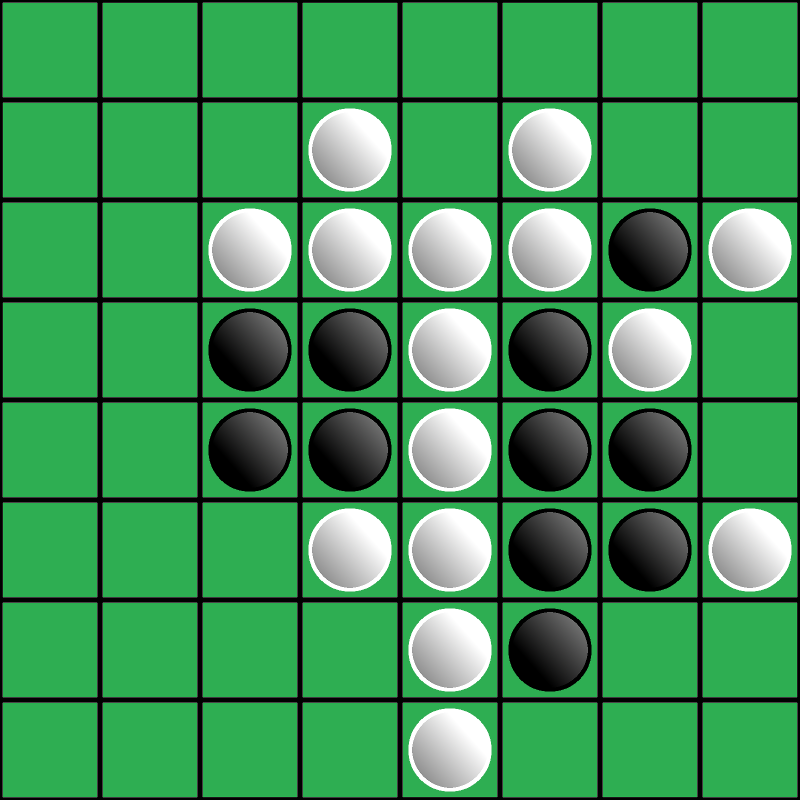 It’s easy to see that Black can play in the middle between white disks. And he can defend his position longer. Let’s look at another situation – Example 8. Example 8 – little wedge is coming! Here, the lonely square between white disks seems the perfect place for black disk. What is common for these two situations? In both cases White left an odd number of empty squares between his disks. Inserting a wedge becomes much more difficult if the number of squares between discs on the edge is even. It’s easy to defend against the wedge if you have a pair – a two-square gap between your disks at the edge. Pair is particularly strong if it does not adhere to the corner. Example of a strong pair is shown below (on the right edge). I warn that not all pairs are immune to attack. And sometimes there are situations when creating 1-square gap is good solution! Let’s look on the image below (Example 10). In this situation playing D1 seems quite good option for White, although it involves leaving a 1-square gap. Even if Black try to attack E1, White can play B1 and then G1 (making a balanced edge). As you can see, the 1-square gap is not always bad. To sum up: a pair of empty squares left between your disks on the edge is the strongest position to defend. In some cases, it will be wise to leave 1-square gap. The safest thing is… not to leave any gaps between your disks on the edge. Besides, it’s worth remembering that filling the gap in your own disks should be done carefully (rather if you have no other option). In theory of many board games there is a concept o tempo. Most often tempo means a speed of developing attack or defense. But Othello is quite different from other games. In Othello you don’t want to capture enemy disks to fast. You don’t want to gain territory to quickly. In many cases you would like to pass your move to your opponent if you only could do that. For this reason in Othello “gaining tempo” means a situation, when a player plays last in particular region of the board and forces his opponent to play somewhere else (somewhere, where no one wants to play). In other words “gaining tempo” means transferring the burden of initiating play to your opponent, without leaving him any safe options. In Japanese “gaining tempo” is called “handing over the move”. Tempo is important at every stage of the game, but it becomes particularly important when playing near the edges. This is well illustrated by the following example from a game between two Japanese champions – Hideshi Tamenori (White) and Ken’ichi Ishii (Black). It was White’s turn. Tamenori decided to play A5 and it seemed stupid. He gave up the left edge and lost a corner. Position after this move is shown below. Black made the most obvious move – A1. He took the corner and secured two edges (upper and left). Resulting position is shown below. Next move of Tamenori was brilliant – B2. At this moment he won tempo and led to the position shown below. This is another example showing that corners are not the most important. Sometimes it’s worth giving them back in exchange for tempo. Is it worth to be a first player who touches the edge? Should you do this at all costs? No, but sometimes it pays to “touch” the edge to “put the anchor down”. An anchor is a single disk on the edge, useful if you have small number of your own disks and there’s a risk of ending the game through wipe-out. In the part 2 of this tutorial I mentioned that too silent play can remove all your discs from the board. Then you’ll lose, even though you were doing so well. Look at the image below. Black has quite good position, but there’s a risk of fail through wipe-out. In this situation it’s good to play H4 (square marked by black star). Note that after touching the edge Black can strengthen its position on this edge. This opens a way to put new disks on the left, top and bottom regions. This lesson could’ve been a bit shocking to you. First of all, you learned that important things are not always the most important. As I said, you have to know rules of strategy, but at the same time you should know these rules do not apply to absolutely all cases. If there were “golden rules of winning” it would be enough to teach them to win any game and then… the game would not make sense. Most notable players in any game know the rules of strategy and tactics very well, but at the same time they are ready to break these rules and even trap opponents who try to apply “rules for winning” everywhwere. I want to make it clear that purpose of this lesson was to present some typical situations and their most common solutions. It will be up to you to decide whether to balance the edge, take the corner, build a pair or leave one-square gap at a given moment. You always have to use your fantasy and imagination. In the next lesson I’ll write a bit more on game endings.